Earlier this year, Friar called John Norman’s work Burroughs pastiches, so I delved into this volume which I bought at Barnes and Noble (the version I read is the Barnes and Noble house brand, not the nice edition linked below). Well, Friar’s comment came to mind, but actually I picked up the book because I rented John Carter recently, and I wanted to compare it to the books. Which I had in a massive volume. 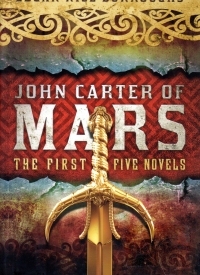 This book, 943 pages of sword novels and appendices/glossaries, includes the first five John Carter books: A Princess of Mars, The Gods of Mars, The Warlord of Mars, Thuvia, Maid of Mars, and The Chessmen of Mars. I read at least the first and the last already. The first (and perhaps the first couple) I read in high school or college, and I remembered little of them except the highlights. I know I read the last later in life, perhaps after college (but not in the last dozen or so years since I’ve been writing book reports on this blog, gentle reader) because I remember the paperback copy I have of it. A Princess of Mars really sets it up: John Carter is transported to Mars from an Arizona cave and finds that he has great strength on the planet with weaker gravity. Already a fighting man, experienced swordsman, and horseman (and a Civil War veteran, but undoubtedly we’ll have to scrub him from literature because he was on the wrong side), Carter meets and has adventures in wooing and rescuing the beautiful Dejah Thoris, eventually leading to a battle that saves her from an unwanted marriage to a rival city’s leader. Carter ends up back on earth after helping restore an oxygen-producing plant that provides the breathable atmosphere for the planet. In The Gods of Mars, Carter returns to Mars after ten years on Earth and finds himself in the Valley Dor, the place down the river that Martians traverse to die. He finds the Therns, who are a priestly caste, who rule the valley, and the valley is attacked by the First Born, and Carter and Co find themselves taken to the bottom of the world where the first born and their goddess live. Carter finds she is no goddess, meets his son, has adventures, and leads a revolt, but his beloved Dejah Thoris is locked in a room for a year with a murderous Thern princess and a friendly princess named Thuvia who can calm Banths. The book ends with this cliffhanger. The Warlord of Mars picks right up with John Carter trying to figure out a way to get into the locked room before a year passes. A First Born and a Thern get into the room first and take away the women, leading Carter and company to the top of the world, I think, to rescue them by leading a rebellion of the Okarians against their tyrannical overlord. As a result of his adventures, Carter has united most of the races of Mars and is appointed the Warlord of Mars, the leader of all. Thuvia, Maid of Mars, switches gears a bit (and is the shortest of the novels in the volume). Carter’s son Carthoris, who bears some of his father’s strength and certainly his spirit, wants to woo Thuvia, but she is promised to another. She is kidnapped, and Carthoris is blamed, so he sets out to rescue her, and at the end, wins her. The Chessmen of Mars features Tara, the daughter of Carter and Dejah Thoris, is wooed a bit forcefully by the prince of another city, but she rebuffs him as he is promised to another. A great windstorm sweeps her away, and the prince takes his cruiser to find her, but they both end up prisoners of a symbiotic race of pure brains that ride headless bodies. Tara does not recognize the prince, and he passes himself off as a mercenary. They escape and find themselves then as prisoners of a tyrant who kills enemies in a game of live action jetan (Martian chess). The prince helps to lead a rebellion against the tyrant, and the fellow to whom Tara was promised married another in the interim–so Tara can marry the mercenary she fell in love with who was the prince the whole time! Reading them all together like this, I got a bit bored with the same tropes repeating book-to-book, and I thought things really slowed down and started repeating themselves in books four and five. With a bit more spacing out, it might be better. I have another omnibus edition that has two of these books and another that I thought I could knock off quickly, but I’m not eager to jump into another Barsoom (the Burroughs name for Mars) story right away. Taken in smaller doses, they’re a fun read, a bit of swashbuckling science fiction/fantasy adventure that holds up decently today if you can suspend disbelief of contemporary civilizations on Mars. Also, ageless Civil War veterans. Books like this have outsized influence on generations of writers because they represent the kinds of fun things to read that you think might be fun to write. Unlike some of the things now, where most fiction is pretty ponderous and a single novel (Stephen King, I’m looking at you) might weigh in at this size. At any rate, I enjoyed most of it for its own sake and for my own nostalgia.